Do you have an FDA cleared pEV? As of March 1, 2019, the Model M — an FDA cleared medical device/power wheelchair and is restricted for sale by or on the order of a physician — is discontinued. Model Ci and Model A are not to be considered medical devices and have not been submitted to the FDA for review or clearance. What types of terrain can WHILL Personal EVs travel on? Model A has all-wheel drive and patented omni-wheel technology, allowing it to travel on rugged surfaces including cracked sidewalks, grass, pebbles and even light snow. It has a ground clearance of 3.5” and can climb over obstacles of up to 3” high. Model Ci has a two-wheel drive system and patented omni-wheel technology, and can travel on moderately rugged surfaces including cracked sidewalks, grass and pebbles. Model Ci has a ground clearance of 2.25” and can climb over obstacles of up to 2” high. Check out the videos on our YouTube channel to see our personal EVs in action. Where can I purchase a WHILL Personal EV? WHILL has an extensive reseller network throughout the United States, and several online channels who sell the Model A and Model Ci. To make sure we match your specific needs, please contact sales@whill.us or call 1-844-699-4455 so that we can identify an authorized WHILL dealer near you. What is the product warranty for WHILL Personal EVs? The Model Ci, Model A and Model M* have one of the industry’s best warranties. They are covered for 5 years on the base and seat frame; 1 year on mechanical and electrical components, and 6 months on the batteries and tires. View the Warranty Policy for complete details. *Note: as of March 1, 2019, Model M sales have been discontinued. What are the prices for WHILL Personal EVs? The MSRP for WHILL Personal EVs are as follows: Model Ci is $4,499; Model A is $9,999. Pricing through providers and resellers may vary. Please contact sales@whill.us or call 1-844-699-4455 for an authorized WHILL dealer who can provide pricing to you. Do WHILL Personal EVs require a prescription? The Model Ci and Model A are not to be considered a medical device and have not been submitted to the FDA for review or clearance. Therefore, Model Ci and Model A do not require a prescription. The Model M* requires a prescription because it is a power wheelchair. Because Federal law restricts this device to sale by or on the order of a physician, a doctor’s prescription is required. Are WHILL Personal EVs covered by medical insurance? WHILL Model Ci and Model A are not to be considered medical devices and have not been submitted to the Food and Drug Administration for review or clearance. Consequently, these products are non-covered (no Medicare benefit). How do I decide between the 16” or 18” wide Model Ci or Model A? This measurement is the width of the seat base and cushion. While in a seated position measure the linear distance between the outside of the hips, including non-compressed soft tissues (Not circumference). If this measurement is less than 16” you will fit best in the 16” wide size. If it is more than 16” you will fit best in the 18” size. *Please note: Model A is only available in a 16” width seat. Can I still purchase a Model M? As of March 1, 2019, sales of the Model M have been discontinued. The Model M — which is a medical device, requiring a prescription — is no longer available through our reseller network. Why use Omni-wheels for the front wheels? The omni-directional wheel technology is one of the advanced features of WHILL Personal EVs that give our products unique capabilities. Conventional omni-directional wheel technology was invented for vehicles such as forklifts and cars but has never been an effective application for wheelchairs and mobility devices due to several design flaws in existing implementations. Seeing these efforts, we believed that the same concept used in these other vehicles could be perfected and ultimately applied to personal mobility to create a revolutionary device. The omni-directional wheel engineered by WHILL, is built using 24 small rollers that collectively create one large wheel. The rollers all move individually, allowing you to glide sideways and achieve a tighter turning radius, while simultaneously providing the greater terrain coverage. Our WHILL engineers have tested and refined the omni-wheel to create a front wheel so sophisticated that it redefines the whole concept of personal mobility. The team’s pride and dedication is evidenced by the attention to detail and countless hours put into this single component on the device. Some may see it as just another wheel, but we see it as the next generation of personal mobility. The fact that omni-wheels do not need to swivel eliminates the dangers and difficulty often found using swiveling casters. Casters need additional room to rotate before changing direction and as they rotate they can get stuck against walls and cabinets. They can also get tangled up in a user’s feet as they rotate, causing injury. See how the WHILL omni-wheel moves here. What are the differences between your Personal EVs? See a side-by-side comparison of Model A and Model Ci here. What are the specifications for your Personal EVs? Model Ci product specifications are coming soon. However, key specifications are available on the Model Ci page here. Model A product specifications are located here. Does the footplate fold up? Yes, the footplate does fold up, allowing easier access into and out of the chair by better positioning your feet on the ground. WHILL Model A is all-wheel drive, but with two motors, how are the front wheels powered? Model A’s front wheels are powered by a belt from the motor. It’s able to power over hills and through rocky terrain, yet maneuver indoors in tight spaces with ease. Note: Model Ci has a two-wheel drive system. What is the top speed and range of Model Ci? Model Ci has four speed options and can reach a top speed of 5 MPH. The iPhone app also offers three pre-built drive profiles (Eco, Normal, Sport). Model A and Model M* have three speed options (slow, medium, fast) with a top seep of 5.5 MPH. Model A and Model M have a range of up to 12 miles and 15 miles, respectively. *Please note that as of March 1, 2019, the Model M is discontinued. Is there a higher weight capacity with the Model A? We hope to increase the weight capacity of the Model A in the future, but at this time, it has a maximum capacity of 220 lbs. However, we have increased the maximum weight capacity to 250 lbs for the Model Ci. I own a 16” wide Model A – can you retrofit it to an 18” width? No, unfortunately at this time we cannot change a 16” Model A to the 18” size. How do I log into the Model Ci and Model A iPhone Apps? To log into the Model Ci iPhone app, please view the Model Ci Quick Start Guide here. What type of personal storage options are available with Model Ci? The Model Ci comes standard with a 20 liter under-seat storage basket. An optional WHILL side bag and walking stick holder are also available for purchase. How stable is Model Ci? Will it tip over? Designed for optimal stability, Model Ci can safely navigate inclines up to 10 degrees and travel straighter on side slopes with built-in anti-sway technology. *compared to two-wheel, rear-drive mobility devices with front caster wheels or three-wheel tiller operated devices. What technology is in the Model Ci to help secure it? You can easily secure your Model Ci to prevent unwanted use by locking it using the iPhone app or with the optional Smart Key. How does the Model Ci perform outdoors? The Model Ci performs great on outdoor terrains such as grass and gravel. It can also climb obstacles up to 2” in height. If you’re an avid hiker that enjoys traveling across rugged terrain, you may want to consider our all-wheel drive Model A. What is the turning radius for Model Ci? The turning radius for Model Ci is 29.9”. Although other products claim they have a smaller turning radius than Model Ci, they may not account for the footplate length, which impacts the overall turning clearance of their device. The Model Ci’s tight turning radius is made possible by our patented front omni-wheel. Watch this video on how it works. The omni-wheels also helps to eliminate caster “flutter” and avoid damage to walls and furniture as the omni-wheels are alway facing forward, whereas casters need extra room to align itself in the direction you want to travel. What type of batteries do you use, and can I purchase regular car batteries if they need replacing? Model A and Model M* use two (2) sealed, non-spillable lead acid (AGM) batteries that require no maintenance. They can only be replaced by an authorized WHILL service provider. Do not attempt to change or remove batteries. Click here for complete battery specs. Model Ci uses a custom Lithium-Ion battery built specifically for this device. Spare batteries may be ordered to provide extra range for your on-the-go lifestyle. What happens when my product warranty runs out? Your WHILL authorized service representative can still perform repairs and maintenance on your WHILL product. They will bill you directly after the warranty period has expired. What does the product warranty cover, and for how long? Products are warranted against defects in materials and workmanship for a period from the date of shipment to you equal to the following: (1) with respect to the base and seat frame, five (5) years, (2) with respect to mechanical and electrical components, one (1) year, or (3) with respect to batteries and tires, six (6) months (“Warranty Period”) in each case when used in accordance with the applicable usage documentation. If a defect arises during the Warranty Period, WHILL will, at its option, (a) repair the affected Product at no charge using new parts or parts that are equivalent to new in performance and reliability, (b) exchange the affected Product with a functionally equivalent Product that is new or formed from new and/or previously used parts that are equivalent to new in performance and reliability or, with your consent, a Product that is at least functionally equivalent to the Product it replaces; or (c) refund the original purchase price for the affected Product. This warranty excludes normal depletion of consumable and/or wearable parts (such as tires, trim components, covers and seat cushions) unless failure has occurred due to a defect in materials or workmanship, and damage resulting from abuse, accident, modifications, unauthorized repairs, or other causes that are not defects in materials and workmanship. No other person is authorized to modify this limited warranty. View the complete warranty details here. Should my WHILL require Maintenance, what should I do? WHILL Personal EVs contain no user serviceable parts. Do not attempt to replace or repair any parts (including the batteries–Model A and Model M* only). Any service should be done by a WHILL-authorized service representative. Our WHILL warehouse stocks finished goods and spare parts. All parts ship next day upon receipt of order. To clean your WHILL Personal EV, wipe with a wet cloth or rag. Only use water, and scrub vigorously to remove scuffs/stains from the plastic covers. *Please note: As of March 1, 2019, Model M sales have been discontinued. Tires should only be replaced by a WHILL-authorized service representative. Check tires regularly for signs of wear as directed below and contact WHILL Customer Support for assistance. Tire replacement intervals will vary depending on the frequency and conditions of use. Tires should not produce unusual noise or vibration when they rotate. Check the rear tires for signs of wear or damage. Rear tires should have no visible deformation or flat spots. How easy is it to clean the front Omni-wheels? Very Easy! Most debris falls right off the tires, but if there is anything left, just wipe the wheels with a damp cloth and you’re done. Help – I need service! First, call the WHILL dealer where you purchased your product for service. Or, please call or email WHILL Customer Service at 844-699-4455 or WHILL Customer Support. As of March 1, 2019, the Model M has been discontinued. However, we will continue to provide service and support for the Model M. For Model M support inquiries, please reach out to our Support Team at support@whill.us or (844) 699-4455. Can I take a WHILL Personal EV on an Airplane? WHILL Model Ci’s rechargeable lithium-ion battery 210-085 has been tested on UN Manual of Tests and Criteria Part 3 Subsection 38.3 and certified to meet the applicable ICAO, IATA and FAA requirements. However, WHILL Model Ci personal mobility device has not been specifically tested for air transport. Airlines require measures to ensure accidental activation of Model Ci does not occur. Model Ci provides a “Lock” feature via the iPhone app. You may also place an “Air-Safe” plug (Purchase Here) into the charger port which will immobilize the device. Please contact your airlines for questions and additional support. WHILL Model A meets TSA guidelines for airline transportation; however, the device has not been specifically tested for airline transportation. WHILL Model A uses a sealed, non-spillable lead acid battery called AGM (absorbed glass mat). Click here for complete battery specs. This type of battery does not require the airlines to disengage the battery. The International Air Transport Association (IATA) has a guideline (Link Here) you can reference. Airlines require measures to ensure accidental activation of Model A does not occur. Model A provides a “Lock” feature via the iPhone app. You may also place an “Air-Safe” plug (Purchase Here) into the charger port which will immobilize the device. Note: WHILL Model M has not been tested for air travel, and WHILL does not approve of air travel with the devices. As of March 1, 2019, Model M sales have been discontinued. How can I transport a WHILL Personal EV in a car? Yes, Model Ci and Model A can be transported in a car, as long as no one is seated in it while moving. 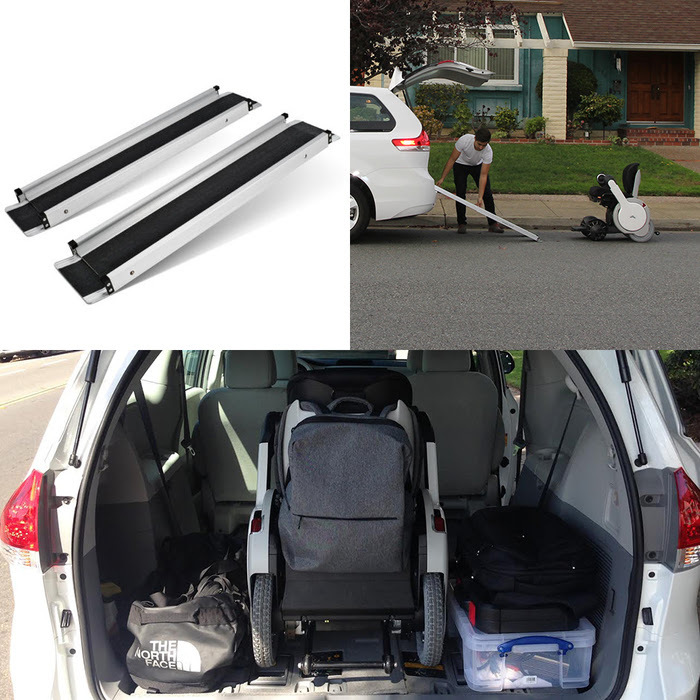 Model Ci can be easily disassembled into three lightweight components for storage and transportation in the trunk of most vehicles. To transport Model A in a vehicle that is not specially modified to accommodate a powered Personal EV you should first ensure that your vehicle is compatible. Generally, a vehicle needs an opening that is 40 inches high and 50 inches wide. We recommend the WheelzAhead Tour ramp, a collapsible and very portable ramp that is 36-60 inches long by 7.5 inches wide. Model A easily drives up the ramp using the directional controller or the remote drive feature, and fits nicely in the back of the car. The loading and unloading process takes about a minute. You should always secure the Model A against unexpected movement when transporting. Model M* can be transported in a car, with or without someone sitting in it. In order to sit in Model M while riding in a car you will need the optional four-point tie-down system that has been RESNA tested for safety. Using the four point tie downs the Model M must be secured to the vehicle and the user should also be secured using appropriate straps and safety belts as described in the Model M User Manual. To transport Model M in a vehicle that is not specially modified to accommodate a wheelchair you should first ensure that your vehicle is compatible. Generally, a vehicle needs an opening that is 40 inches high and 50 inches wide. We recommend the WheelzAhead Tour ramp, a collapsible and very portable ramp that is 36-60 inches long by 7.5 inches wide. WHILL Model M easily drives up the ramp using the directional controller and fits nicely in the back of the car. The loading and unloading process takes about a minute. You should always secure the Model M against unexpected movement when transporting. Step 1. Remove the two back support set screws (one on each side of the back support) using a #4 metric hex key. Step 2. With your hand, remove the back support by sliding it upward and out of the brackets. NOTE: Once back support is removed, reinsert and lightly tighten screws into bracket holes to avoid losing them during transportation. Upon arrival at the destination, unload the Model A from the vehicle then reattach the back support by performing the removal process in reverse. WHILL’s compact products just got even easier to transport thanks to our friends at TriLift Mobility . Now you can bring your WHILL Personal EV wherever you go without having to worry about limited cargo space or bulky platform attachments. TriLift’s minimalistic design compliments the WHILL Personal EV’s petite frame, allowing you to attach your Personal EV to a vehicle without adding much to its length. Even better, TriLift’s simple attachment process combined with your Personal EV’s intuitive functionality makes connecting the two a breeze. The TriLift system requires the attachment of a bracket to your WHILL Personal EV. The bracket is essentially permanent, as it is not meant to be removed on a regular basis, but it does not require any warranty- voiding customization. The Trilift system works as a set. Along with the bracket attached to your Personal EV, TriLift also requires a lift attached to your automobile’s Class II or III hitch. To attach your WHILL Personal EV to the lift, simply back your Personal EV up so that the triangular bracket is aligned with the smaller triangular lift. The lift is powered, so simply use the remote to elevate your Personal EV. You will see the smaller triangle interlocks with the larger one, keep raising the lift until your Personal EV is fully off the ground and secure. Check out TriLift’s gallery to see how it looks on different vehicles. TriLift can be used with any vehicle that has a Class II or Class III Hitch. TriLift costs $3,500 for the bracket plus an installation fee. Click here to find a TriLift dealer near you. For more information on TriLift’s cost and size specifications, contact the manufacturer directly here. Can I take WHILL Personal EVs on public transit? Yes, Model M* power wheelchair can be equipped for public transport. If you are going to ride in Model M while on public transportation be sure to order the optional tie down points. Model M’s 4-point tie down system is RESNA tested and safe to use on any ADA compliant form of public transportation. Check your local public transportation website for more info on bringing your powered mobility device on board. Here’s a link to the Federal Transit Administration Questions and Answers Concerning Wheelchairs and Bus and Rail Service. Model Ci and Model A are not equipped to be ridden in while on public transportation since it only has two securement points in front. Does Model Ci fold up? Model Ci does not fold up; however, it quickly disassembles into three lightweight parts for transportation in the trunk of most vehicles.